Being an Anglican, I have had too many years of the liturgical calendar to feel very Christmassy at the beginning of September. But on Monday, something happened to change that: a balikbayan box arrived from our beloved Trinity REC back in Cincinnati, full of good things. The box was packed by our friends Jay and Mira Sol Eppinga. 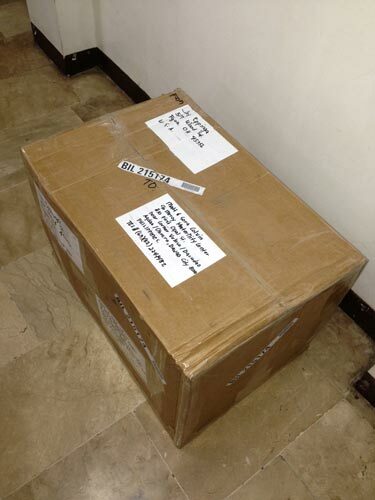 Mrs. Eppinga is Filipina herself, and has family living here, so she knows all about how to pack a balikbayan box. Everything was very snug and secure, and protected from damage and moisture by the careful use of plastic bags. Daghang salamat sa inyo, Eppingas! On the top of the box were all the baby clothes and washcloths for use at the birth clinic. I won’t list everything here, but there were homeschooling math books, tennis racquets, salsa, Crayola markers, a huge container of mixed nuts, a salad spinner, and a new logic board for our old broken MacBook. I am especially delighted with the books. 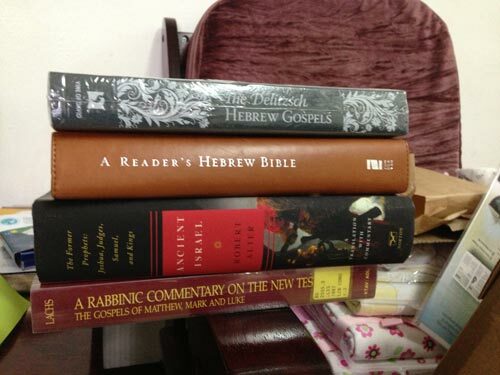 These will help immensely with my prep for teaching my next class at the Reformed Institute of Ministry: Jewish Background of the New Testament. The kids were delighted to see that all their friends back at Trinity REC had made handmade cards for them. There must have been 20 of them!